Rob Wilton: In 2008, we launched Vintage Church in my home. God was really kind to us as we multiplied all over the city. After moving to 13 locations in eight years, we finally settled as we merged with another church. After completing our expansion of the property I stood up to preach at the grand opening. In that moment in 2016, the Lord showed me that I had completed my assignment. After a year of prayer and even pursuing a church in Florida, the Lord opened a door for me to plant another church in Pittsburgh with the North American Mission Board. In August of 2018, we landed in the city excited about our new mission, and we will launch Vintage Church in August of 2019. Prestonwood Network: What does the Wilton family like to do for fun? Rob Wilton: Currently, we love exploring our new city … especially in the winter. We’ve never seen so much snow, so we are having a blast. Pittsburgh is a beautiful place, and we love exploring downtown and the outdoors. Prestonwood Network: How do you balance time with your family and time working and serving the people of Vintage Church in Pittsburg? Rob Wilton: We have family nights and days, but we don’t segment our lives too much. I was thankful to grow up as a preacher’s kid with parents who always included me in our ministry. I never had to compete with the church for their attention. Of course I have to work and be gone at times, but my kids also feel like this is as much their ministry as it is mine. Prestonwood Network: What are a few goals that you have for Vintage Church in Pittsburg for 2019? Rob Wilton: We truly believe that we are in a season where the Lord has promised an amazing harvest. As we plant Vintage Church this year, we are praying for hundreds to receive Jesus. We are also praying that our church will rise up to become a multiplying church for the city of Pittsburgh. I have recently also stepped into the role of Send City Missionary, and we truly believe that harvest is coming through many future plants in our city! Prestonwood Network: What has been some fruit that you have already seen in your time ministering and reaching the people of Pittsburg with the Gospel? Rob Wilton: One of the confirmations of our call to Pittsburgh has not only been the support of many supporting churches like Prestonwood, but also the excitement of the churches that have already been in the city. A couple of weeks ago, our launch team of our church worshipped at a church downtown. and we celebrated our partnership to preach Jesus, plant churches, and serve the city. At the end of our gathering, we celebrated with a baptism. Jesus is changing our city one life at a time. Prestonwood Network: Why is church planting so important? Rob Wilton: The Gospel is the hope of the world. The church is God’s plan for proclaiming the Gospel. We need more churches because people need Jesus. I truly believe that church planting is primarily about leading people to Jesus who would then disciple people to lead others to Jesus. The harvest is plentiful for this mission in Pittsburgh. Rob Wilton: I am praying for patience and power. Patience to plant this second church with a strong foundation for our mission. The stronger the foundation, the larger the impact. Power from the Holy Spirit to transform this city. We are going to plant, water, and we are praying and believing that God will bring the growth. Prestonwood Network: Amen. Thank you, Rob, for sharing your heart and desire to see many people come to Jesus. 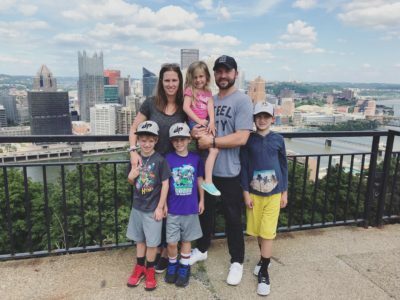 We are praying for you and the Gospel work that you and your family are doing in Pittsburgh. Rob Wilton serves as Senior Pastor of Vintage Church of Pittsburgh. More information on Vintage Church can be found here: www.vintagechurchpitt.com. Please feel free to share a word of encouragement or prayer to Rob at rob@vcpitt.com.